As they are called, so shall they serve. So says the law. Pigeons and doves constitute the animal family Columbidae and the order Columbiformes, which includes about 42 genera and 310 species. The related word “columbine” refers to pigeons and doves. They are stout-bodied birds with short necks, and short slender bills that in some species feature fleshy ceres [cere /sir/: ‘a waxy fleshy covering at the base of the upper beak in some birds’ (NOAD)]. They primarily feed on seeds, fruits, and plants. This family occurs worldwide, but the greatest variety is in the Indomalaya and Australasia ecozones. Pigeons and doves are likely the most common birds in the world. 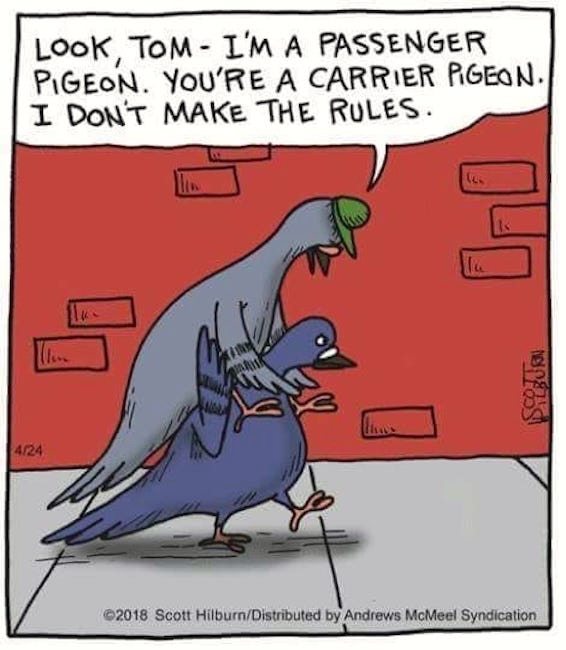 The distinction between “doves” and “pigeons” is not consistent. In modern everyday speech, as opposed to scientific usage or formal usage, “dove” frequently indicates a pigeon that is white or nearly white. However, some people use the terms “dove” and “pigeon” interchangeably. In contrast, in scientific and ornithological practice, [the common name] “dove” tends to be used for smaller species and “pigeon” for larger ones, but this is in no way consistently applied. Historically, the common names for these birds involve a great deal of variation between the terms. The species most commonly referred to as “pigeon” is the species known by scientists as the rock dove [Columba livia], one subspecies of which, the domestic pigeon, is common in many cities as the feral pigeon. The Carrier or English Carrier is a breed of fancy pigeon developed over many years of selective breeding. 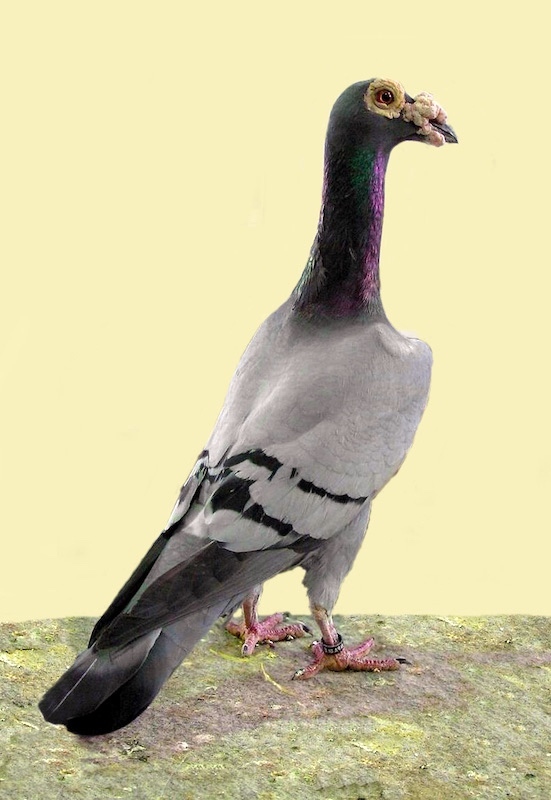 Carriers, along with other varieties of domesticated pigeons, are all descendants of the rock pigeon (Columba livia). They have a long slender body, with a long neck in proportion to the rest of the body, and distinctive features including a rounded hard wattle. The breed was developed in England from a combination of non–European breeds, including the Persian and Baghdad carriers, and the powter. The largest of the flying pigeon breeds, the Old English Carrier was originally used for sending messages. The homing pigeon is a variety of domestic pigeon (Columba livia domestica) derived from the rock pigeon, selectively bred for its ability to find its way home over extremely long distances. The wild rock pigeon has an innate homing ability, meaning that it will generally return to its nest, (it is believed) using magnetoreception. This made it relatively easy to breed from the birds that repeatedly found their way home over long distances. Flights as long as 1,800 km (1,100 miles) have been recorded by birds in competitive pigeon racing. Their average flying speed over moderate 640 km (400 miles) distances is around 80 km/h (50 miles per hour) but speeds of up to 140 km/h (90 miles per hour) have been observed in top racers for short distances. Because of this skill, homing pigeons were used to carry messages as messenger pigeons. They are usually referred to as “pigeon post” if used in post service, or “war pigeon” during wars. Homing pigeons are often incorrectly categorized as carrier pigeons, a breed of fancy pigeons selectively-bred for its distinctively rounded hard wattle. This entry was posted on October 9, 2018 at 12:07 pm and is filed under Categorization and Labeling, Language and animals, Linguistics in the comics, Names, Taxonomic vs. common. You can follow any responses to this entry through the RSS 2.0 feed. You can leave a response, or trackback from your own site. Recalling my commute on the Staten Island Ferry 50 years ago, and encountering a fellow with a cage full of homing pigeons he was transporting far south into Staten Island (the most distant place a native New Yorker can imagine) to release so they could fly home.